Squirrels are among the most commonly seen wildlife, leading many to wonder do squirrels bite. There are over 200 species that can be found all over the world, excluding Australia and Antarctica. While they are not widely accepted as domesticated animals, many people have tried to keep squirrels as pets. Others may choose to befriend squirrels that hang out in their neighborhood or at a nearby park by luring them with peanuts or other goodies. Whether or not this is a safe practice has been widely debated. Squirrels are part of the family Sciuridae, which consists of small to medium-sized rodents. The name comes from their distinctive bushy tail. It is thought to have been derived from the Greek word skioros, literally translated as shade tale. Common animals found in this category include tree squirrels, ground squirrels, flying squirrels, chipmunks, woodchucks and prairie dogs. Squirrels are believed to have originated in North America, but can now be found all around the globe, reading this article you can answer the question: Where do squirrels live? They can tolerate a wide range of environmental conditions, from arctic temperatures to tropical heat. The majority of squirrels are diurnal, so they are commonly seen frolicking on the ground and among the trees. Squirrels do not hibernate, but because they are mammals, they typically prepare themselves a nest or burrow to stay warm in the winter. Since the majority of their food source comes from plant life, you can frequently observe squirrels storing food for the winter months. If you want to know everything squirrels eat, check out this article on What do squirrels eat? . Squirrels are very social creatures; you can often find them chasing and playing with one another, making them extremely entertaining to watch. Squirrels vary greatly among the different species. The smallest is the African pygmy squirrel, and it is only five-inches-long. The Indian giant squirrel can be as large as three-feet-long. 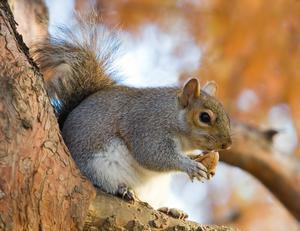 The characteristics and diet of the many species of squirrels can also differ. The three classifications of squirrels include tree squirrels, ground squirrels and the flying squirrel. The squirrel that people are most familiar with is the tree squirrel. This is because these squirrels are active during the day and are typically out where people can see them, instead of hiding in burrows. Tree squirrels are most commonly found in North and South America, but are also located in Japan and the Middle East. These are the squirrels that can be found scampering around in wooded areas, local parks and in neighborhood trees. Tree squirrels are tremendous climbers, which allows them to effortlessly jump from branch to branch. You may also find these squirrels on the ground, foraging for food. Their diet includes nuts, acorns, berries, eggs and baby birds. Some of the more commonly known tree squirrels include the Eastern gray squirrel, the red squirrel and the American fox squirrel. Gray squirrels usually live in the city, and they have learned to coexist with the large population of their human neighbors. This is because they have come to depend on humans for a large portion of their food source. They also can be found in and around oak trees, because a large part of their diet consists of acorns. Red squirrels are less comfortable around humans and typically can be found in coniferous forests. They particularly like to nest in pine trees, because they survive off of their seeds and cones. 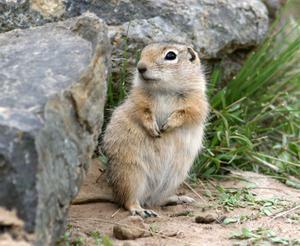 Ground squirrels typically live in burrows like a rabbit. They are most commonly found in North America, but they are also located in the Indomalaya region, Africa and Europe. They are medium-sized squirrels that are closely related to chipmunks, groundhogs and prairie dogs, which also burrow in the ground. They are very social creatures that typically live in colonies with many other ground squirrels, who work together to provide safety and nourishment for each other. They are extremely skilled at building extensive underground tunnel systems. They are in more danger from predators than other squirrels, because they are unable to escape in a tree and lack any natural defenses. They are very agile and are known for their ability to stand up on their hind legs for a lengthy amount of time. The ground squirrel uses this skill to look over tall grass or other obstacles to visualize predators. If there is danger lurking, the squirrel will let out a loud screeching sound to warn others. Their main diet consists of nuts, leaves, roots, seeds, small animals and insects. 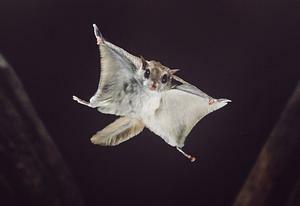 Flying squirrels do not actually fly, but their anatomy allows them to glide from tree to tree. They have a flap of skin that connects their arms and legs, allowing them to travel up to 150-feet when their arms and legs are fully extended. Skydivers have actually invented a suit that imitates the anatomy of the flying squirrel. Flying squirrels live very similar to birds, either in a nest or the small hole of a tree. They are commonly found in the Indomalaya region, Japan, China and Russia. However, they are not as widely perceived as tree and ground squirrels, because they are nocturnal. Their diet is similar to that of tree and ground squirrels and is mainly comprised of nuts, fruits and baby birds. 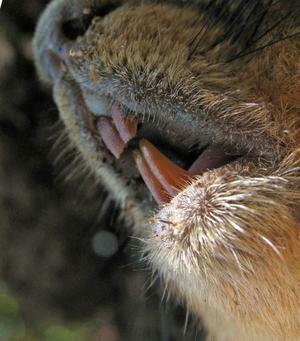 Like other rodents, squirrels have four large incisors that continually grow throughout their lifetime. This is why most rodents can be frequently found chewing on things like tree bark to wear down their teeth. These front incisors are quite sharp. Squirrels also have an additional eight molars, used for grinding seeds and nuts. Squirrels store food in the pouches of their cheeks when transporting it to their home, especially when they are storing food away for the long, cold months of winter. These pouches can greatly expand, allowing squirrels to carry large amounts of food at one time. Squirrels also have flexible front paws and very sharp front claws. This allows tree squirrels to skillfully climb and maneuver from tree to tree. Claws are also essential for ground squirrels to dig their extensive underground tunnels and burrows. This comes in handy for city squirrels to open containers of food left behind by humans. This characteristic is also what exasperates many avid bird watchers, as they desperately try to outsmart the squirrels and keep them out of the bird feeders. Squirrels have a keen sense of vision and hearing. Their very large eyes help protect them against predators. However, their eyes are located on the side of their head, which sometimes makes it difficult for them to see something at the tip of their nose. That is why a squirrel may inadvertently bite the hand that feeds them. The squirrel’s inability to differentiate between a human finger and food may cause a well-intentioned person to get bit when hand-feeding a squirrel, especially when they are still young . The squirrel’s characteristic bushy tail is typically the length of their whole body. Their long tails help them maintain their balance. You can also observe squirrels using their tales as they chatter and communicate with one other. You may find an angry squirrel quickly twitching his tale to announce his frustration. This is particularly common if an unwelcome animal is found in the squirrel’s territory or near a mother’s nest. They are very intelligent creatures, with their own unique language. Squirrels are cute, furry animals, which sometimes causes them to be confused with domesticated animals. They are very social and curious creatures and have quickly learned that where there are humans, there is usually food. For this reason squirrels – particularly ones who live in the city – are likely to approach humans that have food. If you frequently put out nuts or other food for squirrels, they may become repeat visitors. You may even find squirrels coming up to your front door or windows. People who regularly visit the same park to feed squirrels may eventually earn their trust enough for the squirrel to eat out of their hand. However, it is important to remember that squirrels are wild animals and need to be treated as such. They are very different from your domesticated cat or dog; they are used to surviving in the wild, and their natural instinct is to protect themselves from any perceived threat. While many have tried to keep squirrels as house pets, it is important to realize that it is illegal to own wildlife in most states, and it is truly unfair to the animal. Squirrels enjoy running and playing in large open areas with lots of trees, not being cooped up in a cage. If you love and respect wildlife, let them remain free. You can enjoy their playful disposition by watching them in their natural habitat. This brings us back to the question, do squirrels bite? By nature, squirrels are not aggressive animals, but all wild animals will defend themselves when they feel threatened. Even a household pet will bite if they feel they are in danger. You should never corner or try to pick up a wild animal. However, it is uncommon for squirrels to bite. Statistics show that out of all reported human and animal bites, the number of squirrel bites is lower than 1% of the amount of dog bites that occur annually and less than 10% of the reported human bites. When feeding squirrels, first ensure that you are giving them something from their natural diet, not junk food, and also do not attempt to hand-feed any wild animal. If you must feed a squirrel from your hand, do so by placing the food in your palm, and holding your hand flat (like you would feed a horse). If you attempt to hold the food in your fingers, the squirrel may accidentally bite your fingers. Most human interaction with squirrels come from well-intentioned individuals. If you do find an injured or abandoned baby squirrel, there are some safety precautions for both you and the animal that you need to consider. Your purpose in tending to a baby squirrel is to reunite them with their mother. Baby squirrels are very sensitive and regular milk could kill them, so it is essential that you do not try to feed the squirrel. Keep the baby warm by placing them on a blanket or towel, with a warm water bottle underneath. Place the squirrel close to the nest and watch for the return of their mother. If the squirrel is injured, or the mother does not return, you will need to contact a licensed wildlife rehabilitator in your state. If it is an injured adult squirrel, be very cautious when handling them. When an animal is injured, they are very scared and may bite or claw you, to protect themselves. Handle the animal as little as possible; use a towel or piece of cardboard to nudge them inside of a box. You may want to wear thick gardening gloves and long sleeves for further protection. After securing the injured animal, immediately seek the assistance of a wildlife rehabilitator. According to the Center for Disease Control, small mammals such as squirrels, mice, chipmunks and rabbits are very rarely infected with rabies. It is extremely uncommon for them to infect a human with rabies. However, if the animal appears to be sick, then you will need to visit your physician to take necessary precautions. You can find out more information here: Do squirrels carry rabies? If you do suffer a squirrel bite, you will need to treat it according to the severity of the bite. If you have not received a tetanus shot within the past 10 years, you will want to get immunized. You will need to flush out the wound by placing it under running water for at least one minute. Wash the wound thoroughly with soap, and apply an antibiotic ointment to prevent the risk of infection. If it is a deep penetrating wound, apply pressure with a clean cloth, and seek emergency treatment. For severe wounds, you may require stitches. If there is any risk of rabies, seek immediate treatment from a licensed healthcare professional.